Palm trees are known for their wide range of species. The process of selecting the best species for landscaping can therefore be daunting especially for those that are new to the home garden skills. This should not be much of a task when we are on sight. We stock a large variety of species, sizes, and shapes of palm trees to offer Floridians a wide range of options to choose from. We have even made the selection process even much simpler by having our team of professionals at site. Among the various species of palm trees we have in stock include the gigantic Washingtonia palm, which has a very fast growth rate and can be massive and huge on reaching a full maturity stage. The areca palm tree on the other hand can grow between 8 and 10 feet upon maturity, though we also have container grown sizes. If looking for something elegantly massive to bring the majestic essence of nature to life, then findingMedjool date palm for sale would be a great idea. This variant species of palm tree is one of the oldest plants ever grown by man and when included in a landscape, they produce that classic appeal that a classic home design deserves. Medjool date palms find their origin from Morocco in Bou Denib Oasis. Due to this reason, its maintenance and watering is very low. It is adapted to the desert conditions of the Northern Africa, hence it would be nice to have it as part of the landscape. Medjool date palm belongs to a large group of palms known as phoenix dactylifera. This group of palm dates are known for their edible dates which are truly distinctive and delicious. The dates produced by Medjool date palm are sweet with higher moisture content as compared to other variants of the date palms. Therefore, apart from the beautiful serenity brought by this palm in the landscape, one stands to enjoy the sweet and delicious palms produced by the date palm. This definitely sounds as one of the best reasons to find Medjool date palm for sale. Since the dates are sweet and edible, they are also sold on commercial basis, probably the reason why this palm costs a fortune. The female species of Medjool date palm are the most commonly used for landscaping not only due to their sweet delicious dates but also for their tropical appeal to a landscape. Both the female and male date palm are used for landscaping the tropics due to their naturally beautiful appeal plus their historic background. 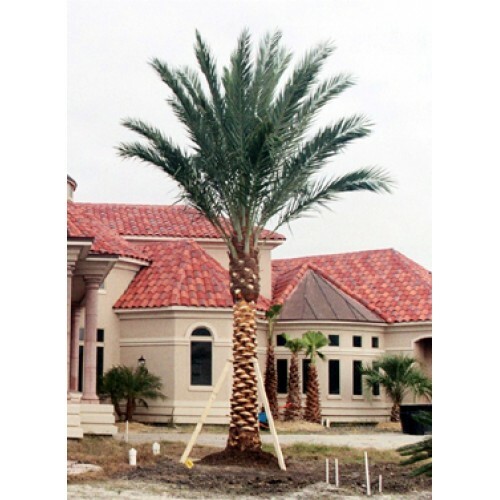 Finding Medjool datepalms in Florida is quite a task and that is why we have stocked it to offer the great serenity given by these plants to Floridians. The date palm can offer great aesthetic performance as single specimen plant, but they can also provide a beautiful attractive landscape when used in large numbers. The date palm guarantees a long life since they can live up to 200 years. If not much interested with the dates, one may consider the male species since they do not produce dates annually once they reach maturity. They can also grow to heights of up to 80feet, suitable for distracting heavy storms. We offer our Medjool date palm for sale at affordable prices as from $3800,unlike other distributors of palm tree who might offer it at much higher prices.